PVC Clamshell Holders 4 Place & 10 Place for Storage and Shipping. 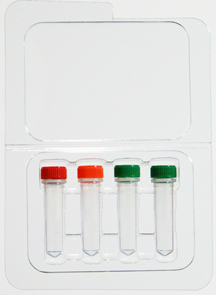 Custom designed specifically for 2mL microcentrifuge tube shipping and storage. The tube slots securely clamps the tube and will not dislodge or fall off even when opened upside down. Easy clamshell lid closes firmly. Containers can also be used for convenient freezer storage.